Consistent with our gospel values, NDP’s mission is to strengthen students in mind, body and spirit. In addition to the spiritual formation that NDP’s theology curriculum provides, students are provided with additional opportunities to build their faith and understanding of their life’s mission. We are rooted in prayer. All classes and student activities begin with prayer. In addition, students, faculty and staff, pause to pray a daily spiritual exercise developed by St. Ignatius Loyola called the Examen. Making time for prayer each day brings the NDP community in to a more full, conscious relationship with God. Parents are the primary religious educators and nurturers of their children’s spirituality. A practicing religious home is the best preparation for young people to become caring, responsible citizens of our world. NDP partners with parents by offering students the following opportunities and experiences. Prayer is conducted daily before school, at the beginning of each period, after lunch through the Daily Examen and at the end of the school day. Mass is celebrated daily in the chapel on campus and an all school Mass is celebrated in the gym approximately once a month. All members of the NDP community are welcome to all Masses. Adoration of the Blessed Sacrament is observed the first Friday of each month. First Friday adoration is held from 7:30 a.m. – 3:15 p.m.in the Chapel. The Sacrament of Reconciliation is available any day by appointment. Days of Reflection are held annually, providing opportunities for students to reflect on their relationship with God and develop a sense of community with their peers. 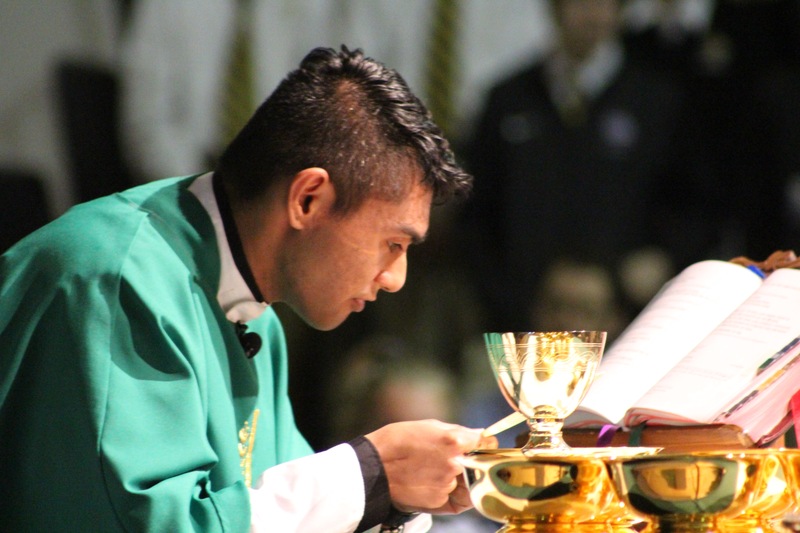 Mass is celebrated at 7:05 a.m. Monday-Friday in the Chapel and at lunch on select days. Students, faculty, staff and family members are encouraged to utilize this valuable grace opportunity. Parents are encouraged to attend as well. All-school Masses are celebrated each month. All students are expected to attend, to participate, and to behave in a reverent manner. Parents are always welcome to attend these school Masses. Each first Friday of the month, Adoration of the Eucharist will begin after the 7:05 a.m. morning Mass. Adoration concludes with Benediction at 3:15 p.m. Students, faculty, staff and family members are welcome. During the seasons of Advent and Lent, arrangements are made for the student body to gather to celebrate this sacrament. Beside the Christian service each student completes individually, there are a number of opportunities for our school community to serve those in need. Collections of food, clothes, and money are held regularly throughout the year and ensure that the NDP community continues to be recognized as one of loving service.